This simple Applesauce Bread is the perfect way to enjoy some of fall’s best flavors. 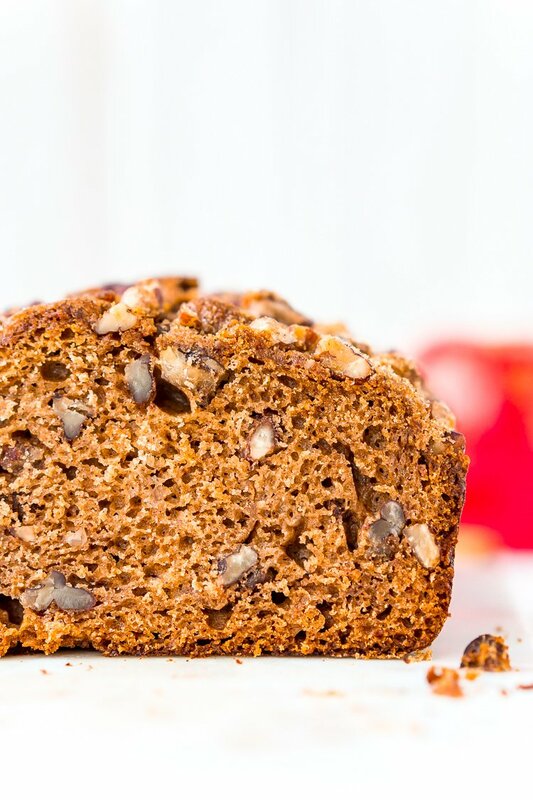 Laced with warm spices, brown sugar, and chopped pecans, this quick bread is a delicious treat to make and share during the autumn season. After you’ve picked a few bags of apples and head home from the orchard, what do you do with them? 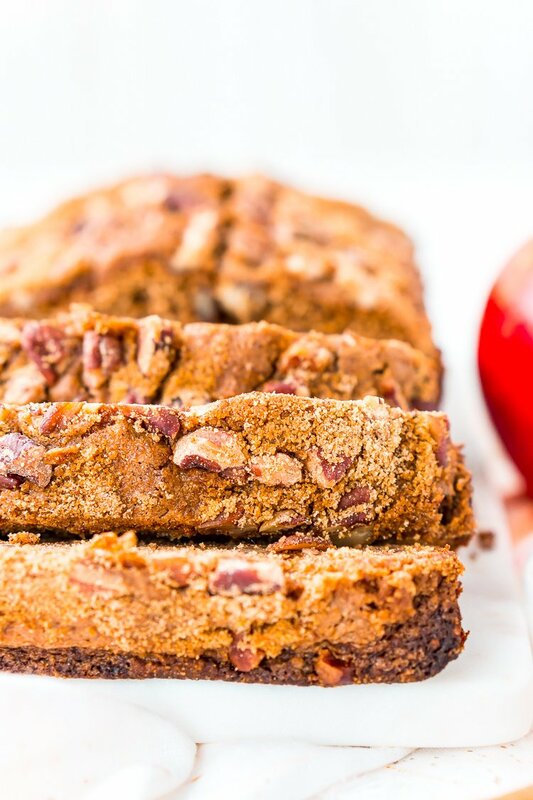 You make a big batch of applesauce, then use some to make this sweet and cinnamon-y Applesauce Bread! This recipe features some of fall’s best flavors in one loaf, and as we know, fall flavors are the best flavors! Brown sugar, cinnamon, nutmeg, and apple pie spice fill each moist, dense slice. Chopped pecans add some crunch throughout, and of course, there’s the light apple taste from the sauce! JUST TAKE ME TO THE APPLESAUCE BREAD RECIPE ALREADY! 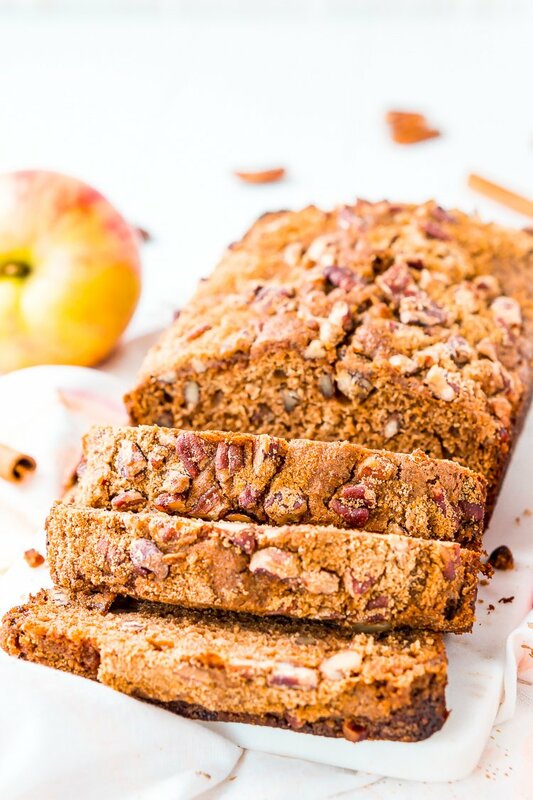 If you’d rather skip my (very helpful, I think) tips and tricks, essential cooking info, and similar recipe ideas – and get straight to this deliciously easy Best Ever APPLESAUCE BREAD Recipe – simply scroll to the bottom of the page where you can find the printable recipe card. This recipe is the perfect way to use your fresh-picked apples, especially if you make more applesauce than you can eat (but you can use the jarred kind too!). It’s also super easy to make, so you may find yourself baking several loaves throughout the season. A quick bread is a culinary term for a bread-like product that uses baking soda or baking powder, instead of yeast, to leaven it. The texture of a quick bread is very different from a yeast bread. A quick bread has more of a muffin-like texture. One of the things I love about quick breads like this is that there’s no wrong time to eat them! You can have a slice or two for an afternoon pick-me-up along with coffee or tea, or enjoy a piece for dessert with a scoop of vanilla ice cream. Personally, I like Applesauce Bread for breakfast, and with a light layer of cream cheese, it’s so good! You can also try other spreads like butter, apple butter, or this whipped Homemade Cinnamon Butter that’s to die for! 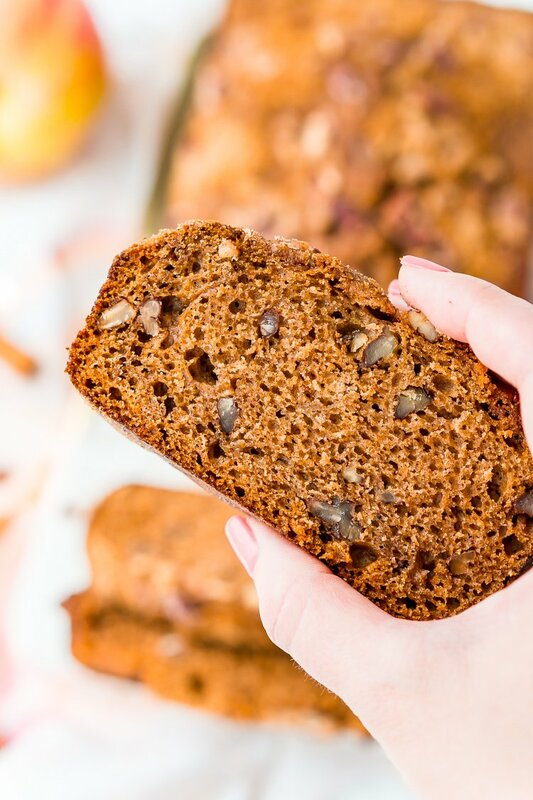 I always like having some sort of seasonal treat on hand in case we have surprise guests or we’re invited somewhere, and this Applesauce Bread is perfect to share. It’s a wonderful recipe to bring to potlucks, get-togethers, or even to work (and trust me, your co-workers will love you for it). 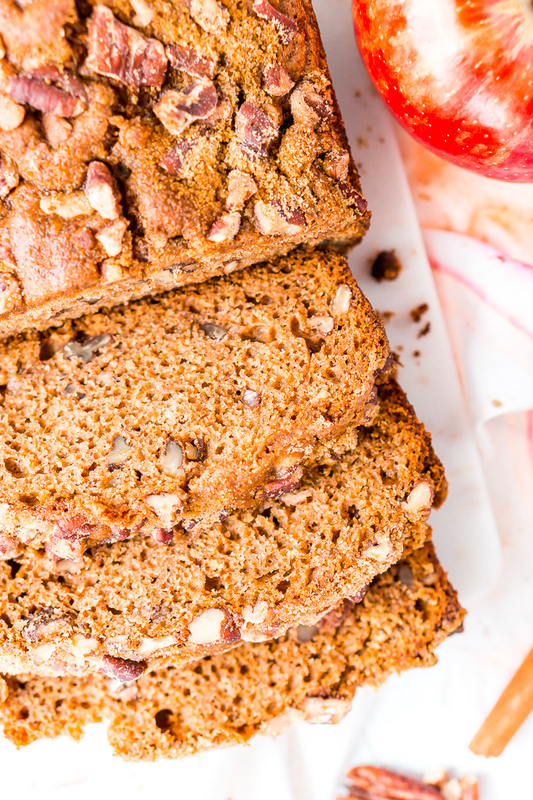 Whether you’re craving apples and spice or you’ve picked a few too many at the orchard, this simple Applesauce Bread recipe is the perfect way to enjoy some of autumn’s best flavors! How Do You Make Apple Bread? Or in this case, Applesauce Bread! I prefer to make applesauce as opposed to using fresh diced apples because I think it results in a better texture and flavor. No one wants to bite into a cold mushy piece of apple, amirite? This way, you just get a tender loaf of bread chock full of nuts, if desired! 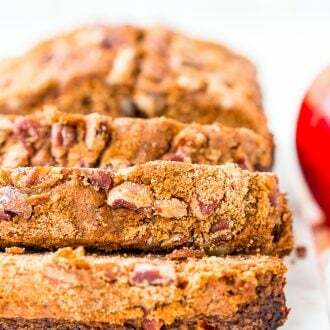 To make this Apple Bread, you’ll begin by preheating the oven to 350 degrees F and greasing two 8×4 or 9×5-inch loaf pans with non-stick spray and setting them aside. Next, in a large bowl or stand mixer fitted with a whisk attachment, combine the applesauce, oil, sugars, eggs, milk, and vanilla and mix on low speed just until combined. Then, in a separate, medium bowl, whisk together the flour and spices. Add the dry ingredients to the wet ingredients in two separate additions, mixing between each one and scraping down the sides of the bowl as needed. Fold in the chopped pecans and divide the batter evenly between the two loaf pans. In a small bowl, combine the topping ingredients and then evenly sprinkle over the two pans of batter. Bake for 60 to 70 minutes or until a cake tester comes clean from the center of the loaves. Remove from the oven and allow to cool in the pan full before removing and enjoying. Can You Freeze Apple Bread? Absolutely! Begin by cooling the bread completely before freezing. To freeze, place the bread in freezer bags, squeezing out any excess air. Label the bag with the recipe name and date and place in the freezer. Use within 3 months for the best flavor and texture. Quick bread loaves can be thawed completely at room temperature or in the fridge and then enjoyed as if just baked. 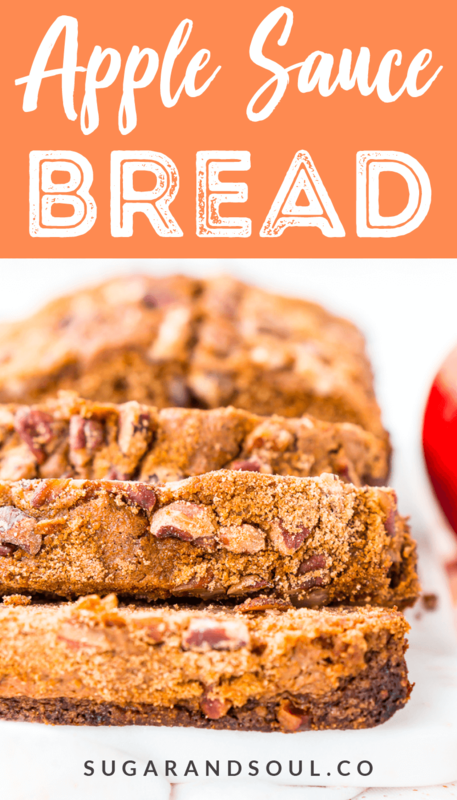 Pin this Applesauce Bread Recipe for Later! Preheat the oven to 350 degrees F and grease two 8x4 or 9x5-inch loaf pans with non-stick spray and set aside. In a large bowl or stand mixer fitted with a whisk attachment, combine the applesauce, oil, sugars, eggs, milk, and vanilla and mix on low speed just until combined. In a separate medium bowl, whisk together the flour and spices. Add the dry ingredients to the wet ingredients in two separate additions, mixing between each one and scraping down the sides of the bowl as needed. Nutrition facts are per loaf. To freeze, place the bread in freezer bags, squeezing out any excess air. Label the bag with the recipe name and date and place in the freezer. Use within 3 months for the best flavor and texture.